Selk Ghaffari M1, Marjani M, Masoudifard M.Oculocardiac reflex induced by zygomatic arch fracture in a crossbreed dog.J Vet Cardiol. 2009 Jun;11(1):67-9. A 3-year-old crossbreed male dog was presented with a history of blunt facial trauma. Skull radiographs showed right zygomatic archfracture. An electrocardiogram revealed bradycardia, first-degree atrioventricular block and QT prolongation. Standard biochemical profile including electrolytes was normal. Atropine response test (0.04 mg/kg intravenously) restored normal sinus rhythm at a rate of 140 bpm with normal QT and PR intervals. This observation is consistent with oculocardiac reflex secondary to zygomatic arch fracture . A 3-year-old crossbreed male dog was presented for facial trauma that occurred 7 days earlier. Prior treatment included dexamethasone and gentami- cine without improvement. On initial physical examination, the dog was alert and responsive. Right facial swelling and a small open wound were noted in the affected region. Mild pressure was applied over the swollen area resulting in purulent discharge from the wound. There were no other injuries to the maxilla and mandible, but opening of the mouth was painful. The mucous membranes were pink with a capillary refill time less than 2 s.
Cardiac auscultation revealed a heart rate of 60 bpm. No heart murmur or arrhythmia was detected. Skull radiographs indicated right zygo¬matic arch fracture. The 6-lead electrocardiogram (ECG) confirmed bradycardia with first-degree atrioventricular (AV) block and prolonged uncor¬rected QT interval (0.32 s) (Fig. 1A). It should be noted that this measure of the QT interval includes the late positive deflection of the supposed biphasic T wave. This last waveform in fact may be a U wave, but this is not possible to confirm. Systolic blood pressure measure with the Doppler method was 70 mmHg. There were no obvious abnormalities on thoracic radiographs. Complete blood count revealed mild neutrophilic leucocytosis. Figure 1 Lead II, 10 mm/mV = 1 mV, 50 mm/s. (A) Electrocardiogram during initial admission of dog showing sinus bradycardia (60 bpm) with PR interval prolongation in first (0.20 s) complexe. Increase QT interval is also present in all complexes (0.32 s). However, note that the final repolarization (positive) deflection may be a U wave. (B) Rhythm strip obtained from the same dog following administration of atropine showing normal sinus rhythm. Standard biochemical profile including electrolytes was normal. Atropine response test (0.04 mg/kg intra¬venously) restored normal sinus rhythm with a rate of 140 bpm and normal QTand PR intervals (Fig. 1B). Arterial blood pressure improved to 150 mmHg. Surgical exploration was performed and necrotic tissues were removed. Bacterial culture from the facial abscess was positive for Staphylococcus aureus. Reduction of zygomatic arch fracture was performed. No cardiac arrhythmias were noted during hospitalisation. In our case, the most notable ECG abnormalities were bradycardia, first-degree atrioventricular block and QT interval prolongation. Typically, bradycardia in dogs is attributed to anesthetic overdose, increased vagal tone, sick sinus syndrome, hypothermia, and administration of vagomimetic or sympatholytic drugs.12 The patho¬physiological mechanism of bradycardia in this case is possibly due to vagal stimulation induced by the oculocardiac reflex. Delay in AV conduction, identified as PR interval prolongation, was also attrib¬uted to vagal stimulation following zygomatic arch fracture. Strong vagal stimulation may block trans¬mission through the AV node.13 Other causes for prolongation of conduction through the AV node include drugs (e.g., digoxin, opioids), and organic disease of AV node.14 The cause of QT prolongation (even with the consideration that the final repolar¬ization wave is a U wave) in this case is likely related to the presence of bradycardia. Acquired QT interval prolongation can be caused by many factors in both humans and other animals: Drugs, serum electrolyte abnormalities (hypocalcemia, hypokalemia, and hypomagnesemia), interventricular conduction delay, hypothermia, central nervous system disease, and bradyarrhythmias.15,16 Para¬sympathetic (vagal) tone has little or no direct effect on ventricular repolarization, exerting only indirect effects secondary to changes in heart rate.17 These electrocardiographic signs were completely resolved after administration of atro¬pine. This supported the hypothesis that the ECG changes were related to stimulation of para¬sympathetic fibers in the periosteum of the zygo¬matic bone. 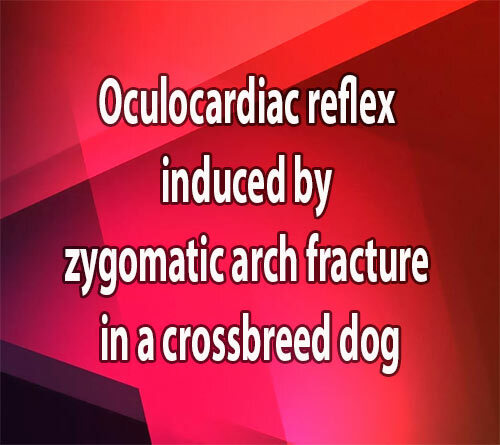 In conclusion, this case report serves to alert veterinarians to a possible hazard of oculocardiac reflex in dogs with zygomatic arch fracture. In those cases, ECG monitoring is highly advised in order to allow recognition of cardiac arrhythmias secondary to oculocardiac reflex. Gilani SM, Jamil M, Akbar F, Jehangir R. Anticholinergic premedication for prevention of oculocardiac reflex during squint surgery. J Ayub Med Coll Abbottabad 2005; 17:57-59. Schaller B. Trigeminocardiac reflex A clinical phenomenon or a new physiological entity. J Neurol 2004;251:658-665. Ohashi T, Kase M, Yokoi M. Quantitative analysis of oculo¬cardiac reflex by traction on human extraocular muscle. Invest Ophthalmol Vis Sci 1986;27:1160-1164. Gandevia SC, McCloskey DI, Potter EK. Reflex bradycardia occurring in response to diving, nasopharyngeal stimulation and ocular pressure, and its modification by respiration and swallowing. J Physiol 1978;276:383-394. Campbell R, Rodrigo D, Cheung L. Asystole and bradycardia during maxillofacial surgery. Anesth Prog 1994;41:13-16. Clutton RE, Boyd C, Richards DLS, Schwink K. Significance of the oculocardiac reflex during ophthalmic surgery in the dog. J Small Anim Pract 1988;29:573-579. Dornberger I, Quast D, Velhagen KH, Bellach J, Guckler A. The oculocardiac reflex during vitrectomy under neuroleptanalgesia. Anaesthesiol Reanim 1991;16:94-106. Cha ST, Eby JB, Katzen JT, Shahinian HK. Trigeminocardiac reflex: a unique case of recurrent asystole during bilateral trigeminal sensory root rhizotomy. J Craniomaxillofac Surg 2002;30:108-111. Loewinger J, Cohen M, Levi E. Bradycardia during elevation of a zygomatic arch fracture. J Oral Maxillofac Surg 1987; 45:710-711. Kosaka M, Asamura S, Kamiishi H. Oculocardiac reflex induced by zygomatic fracture; a case report. J Cranio- maxillofac Surg 2000;28:106-109. Doyle DJ, Mark PW. Reflex bradycardia during surgery. Can J Anaesth 1990;37:219-222. Kittleson MD, Kienle RD. Diagnosis and treatment of arrhythmias (Dysrhythmias). In: Kittleson MD, Kienle RD, editors. Small animal cardiovascular medicine. St. Louis: Mosby; 1998. p. 449-494. Petrus D, Henik R. ECG of the month. Third-degree atrioventricular block with a multifocal idioventricular escape rhythm in a dog. J Am Vet Med Assoc 1996;208: 1022-1024. WareWA. Diagnostic tests for the cardiovascular system. In: Nelson RW, Couto CG, editors. Small animal internal medicine. 3rd ed. St. Louis: Mosby; 2003. p. 12-50. Maisenbacher HW, Adin DB. ECG of the month. J Am Vet Med Assoc 2006;229:40-42. Tilley LP. Analysis of canine P-QRS-T deflections. In: Tilley LP, editor. Essentials of canine and feline electrocardiography, interpretation and treatment. 3rd ed. Philadelphia: Lea and Febiger; 1992. p. 59-99. Dennis SG, Wotton PR, Boswood A, Flaherty D. Comparison of the effects of thiopentone and propofol on the electrocardiogram of dogs. Vet Rec 2007;160:681-686.